You are here: Home / CritterGuide / CritterGuide / 7. Do you Nudi? 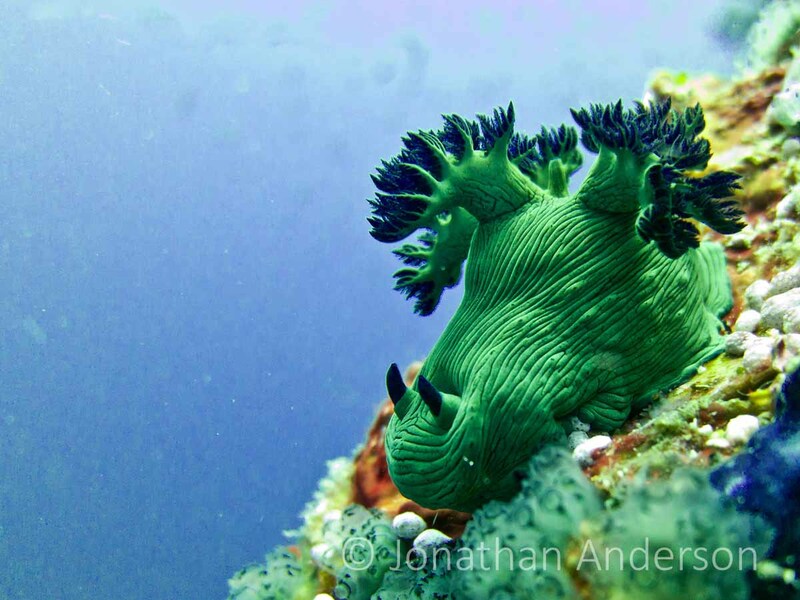 Nudibranchs (pronounced noody-branks) are an underwater photographer’s dream. Bizarre shapes, fantastical colours and an inability to move particularly quickly make for very popular subjects. But they are much more than oceanic eye-candy. 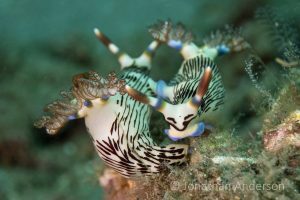 These slugs are Nembrothas, a wide-ranging species in the largest family of the 4 sub-orders of Nudi – the DORID family. Enter the world of “slugs on acid”…..like far out man. In common with most dorid nudibranchs, Miller’s Nembrotha has an exposed set of branched gills (hence the name nudibranch……bare lungs), surrounding their bottom. A design flaw in most creatures you would image. The horn-like antenna are called Rhinopores which are sensitive to light, taste, and smell, so at least they are positioned correctly as far from its bum as possible. 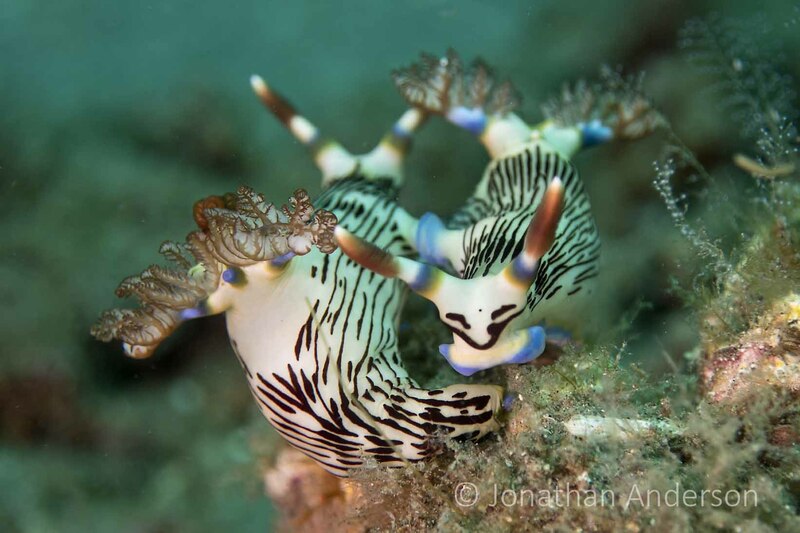 A very pretty Nudi, the Lined Nembrotha has some distinctive blue rings around its rhinopores and gill branches. These pair are not ‘hi-fiving’ eachother by the way. This is how some Nudis make Nudi-babies….all Nudis are hermaphrodites, meaning they have both sets of reproductive organs. This maximises their chances of mating, since the ocean is a big place and they need to be able to mate whenever the opportunity presents. They are in need of dating app, we think. 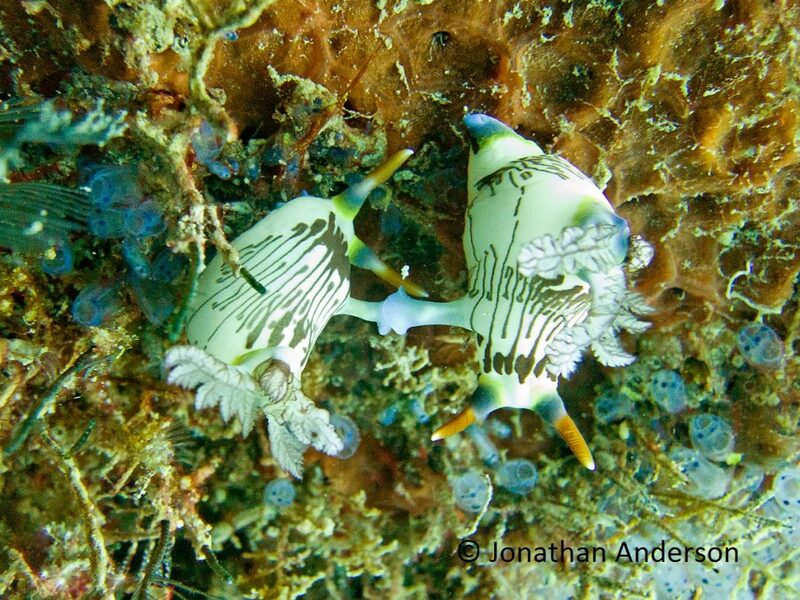 Here’s a pair of Kubaryana’s Nembrotha getting all amourous. 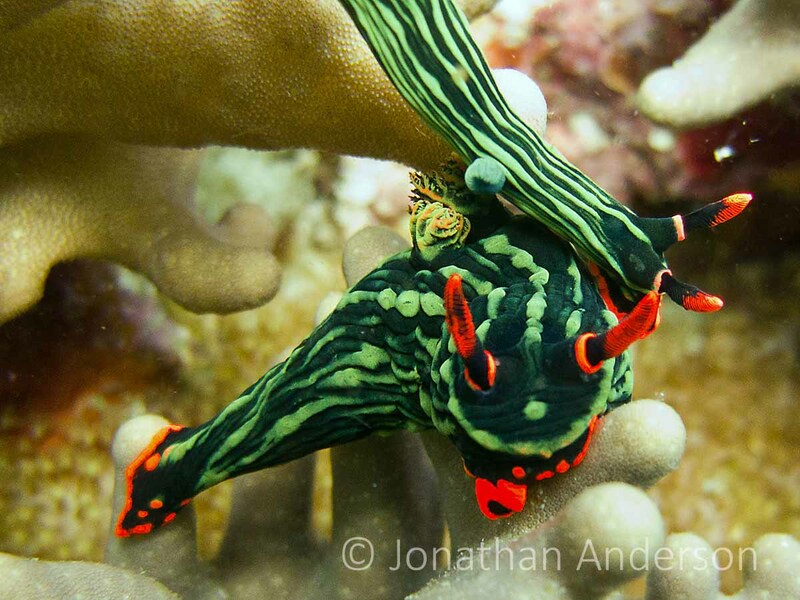 Most commonly found here in Dauin in this colour scheme of black with raised green red flourescent strips, Kubaryana’s Nembrotha has got to be one of the most eye-catching slugs around. Poor things only live for a few months, so the romance is brief…. Another gorgeous green and black combination, the raised green lumps are known as tubercles. 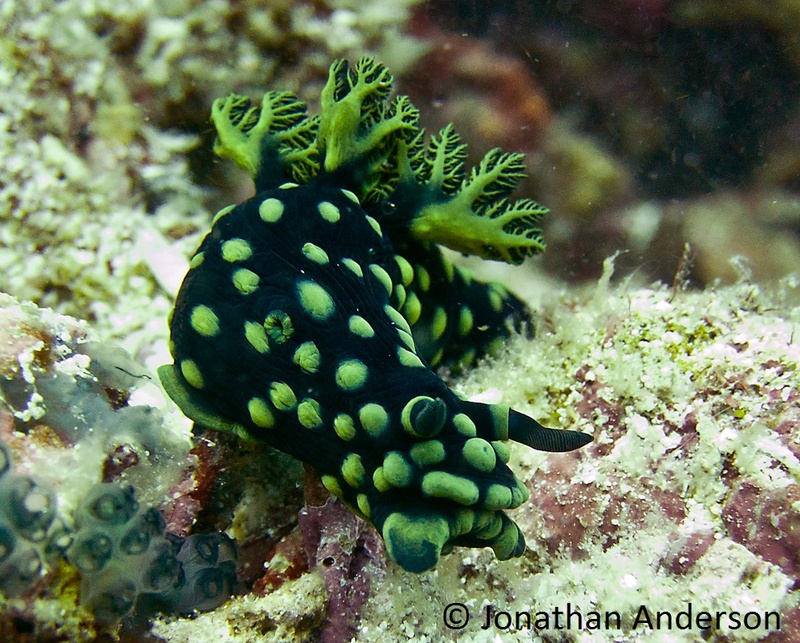 Nembrothas get some of their colouring through what they eat, so these guys must adore spinach and Marmite. Chamberlain’s Nembrotha comes is a wide variety of colours, mainly cream with flashy patches of red and purple. 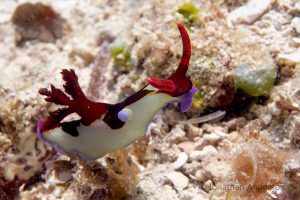 Unlike some the Nembrothas, Chamberlain is quite slim and athletic, if slugs can be athletic that is. As with a lot of Dorid Nudibranchs, Chamberlain’s Nembrotha’s diet includes toxic elements that it absorbs to release later as a repellent to deter others. Eating baked beans and brussels sprouts creates a similar effect in humans. My favourites, great photos and interesting to read! Thanks. Awesome!!! Thanks so much for posting! !